It's mind boggling that it's been three years since the launch of Passports With Purpose and the first time that I, in collaboration with Kamoka Pearls, have donated a Tahitian Pearl (or more) to the cause. And what's amazing is that every year the wonderful folks who organize this fundraiser seem to come up with even more vital causes and raise significantly more money. This year to me is the best yet: clean water. There's not a more basic need than that. And the location, Haiti, is where this should happen. With donations towards the unusually special array of blogger prizes (tours, gift vouchers for flights and hotels and even a ukulele) PWP hopes to raise $100,000 this year and proceeds will go to Water.org to dig wells for clean water in Haiti. I have never been to Haiti (I lived in Tahiti for 15 years and I cannot count the times that people have mixed the two up and asked me about the earthquake) but I'm fortunate to have a colleague Paul Clammer (@paulclammer you should all follow him) who wrote the Haiti guidebook for Lonely Planet and has more recently written a very comprehensive Haiti guide with Bradt publishing. Through Paul's tweets and Facebook I've followed photos, stories and snippets that have made it clear how desperate things are over there. Throughout my travels I've met heaps of aid workers and villagers who have things to say about aid workers and I've never heard more glowing reports than of a Peace Corps volunteer in Vanua Levu, Fiji who almost single-handedly brought clean water to a remote corner of the island. The villagers told me that within the first year they noticeably saw their children become, bigger, healthier and more thriving. I can't imagine how it would be to raise a family while constantly getting parasites or worse, and hoping that whatever came along wouldn't be strong enough to kill. Eradicating that fear and seeing the whole community thrive has got to be the biggest game changer there is. So there it is. 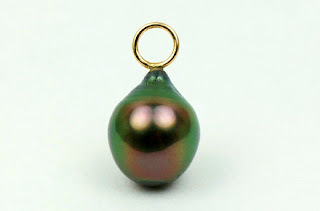 In hopes of helping this year's drive reach it's goals (I have no doubt it will so let's go for way past those goals) my husband Josh at Kamoka Pearls and I have donated a truly spectacular pearl. It's dark and bright with a liquid-y, deep orient that makes you want to touch it, hold it and wear it against your skin. It's mostly green with hues of purple and pink. 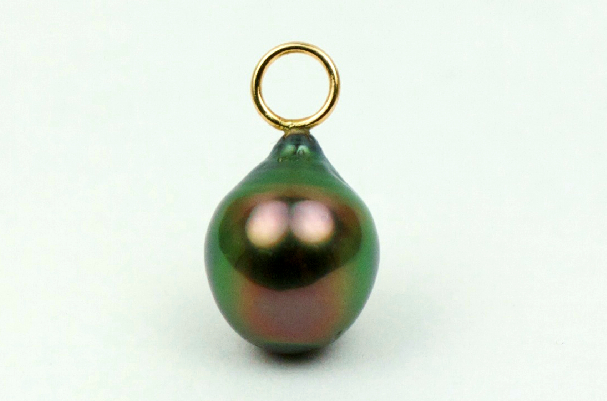 We decided to mount this pearl with a very simple loop to show off how gorgeous it is, in no need of extra fanfare. If this were in our online shop we'd price it at $430. It's a gem. So go over to Passports With Purpose and donate! We always donate too and last year we won a fabulous wine tour of the Walla Walla area of Washington State. Not bad for a donation that felt good anyway!